In the teeming heart of the Amazon rain-forest, a wide column of army ants annihilates all creatures unable to flee the swarm. But one animal -- the tiny Antbird - is attracted by the ants. Not to eat them, but to dine on the banquet of insects flushed out by the voracious line of attacking workers. Because army ant colonies roam randomly through the jungle, Antbirds must sometimes forage outside their territory in small flocks -- creating special problems for territorial males. A loud call alerts the Antbird's neighbors about his presence. If the bird has a mate, she will reinforce his song with a second short call imbedded within his. This duet informs others that they are a pair. But what are they trying to accomplish? By using recorded Antbird calls, Nathalie Seddon and Joe Tobias of University of Oxford, UK have suggested an explanation. If the pair hears the recorded call of a male intruder, the male Antbird calls more vigorously. A female trespasser produces a more rapid and louder duet from the female. In each case, the duet seems to be sending a clear signal for single birds to steer clear. 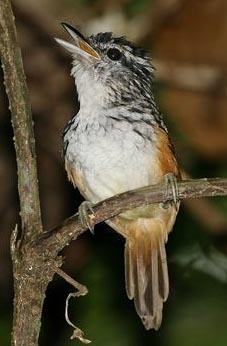 Further study by Tobias and Seddon showed that "married" male Antbirds are not immune to temptation by other females. Some male birds may alter their call when they hear a female -- shifting to a more complex song intended to lure the strange female closer. In these cases, the mated female changes her song too -- attempting to drown out or "jam" her partner's sexual signal. The duet has turned into a domestic argument! In fact, the social Antbirds are exchanging a nuanced conversation that is not so different from one you might hear between human couples flirting over a dinner table. The strategy must be a successful one. Antbirds are distributed widely over central and south America, and encompass over 200 species. My appreciation to Joe Tobias for permitting use of his image of a Peruvian Antbird.